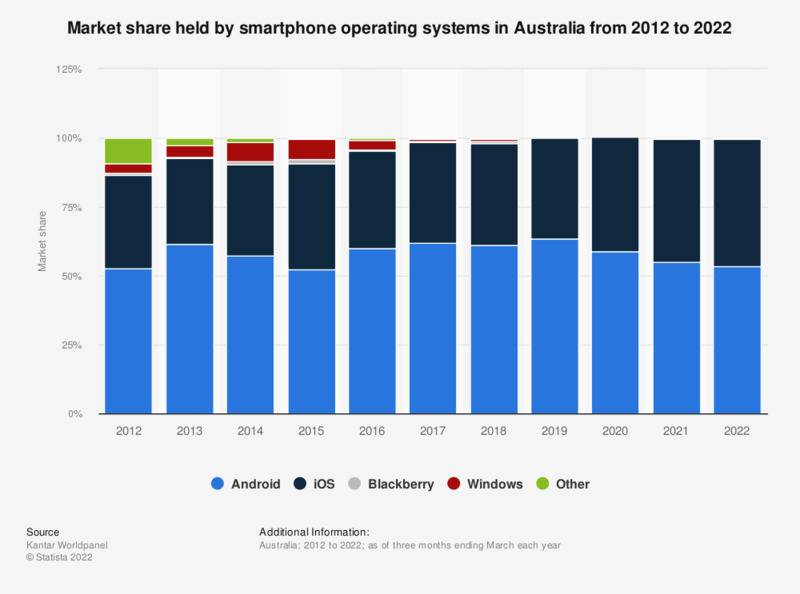 This statistic shows the market share held by the leading smartphone operating systems in Australia from 2013 to 2018, by month. In December 2018 the Android operating system had a market share of 56.5 percent in Australia. Smartphones are becoming increasingly popular in Australia and it is estimated that in 2017, 83 percent of all mobile users will have a smartphone, in comparison to 74 percent of users in 2014. The vast majority of people in Australia already have a mobile phone, with the number set to reach 19.4 million people in 2017. The smartphone industry is also on the increase globally with 31 percent of the world’s population due to own a smartphone by 2017. The dominance that the Android operating system has seen globally since 2012, with a forecasted 84.8 percent share in the smartphone market predicted for 2016, can also be seen in the Australian market. Android had a 55.7 percent share in the Australian market in January 2017, in comparison to the 42.4 percent share of Apple’s iOS, its nearest competitor. The fierce competition between the two smartphone providers can be seen by the fact that Android’s year-high peak of 68 percent of the market share in June 2014 coincided with one of iOS’s lowest figures for the year. This rivalry is set to continue with Andriod and iOS predicted to hold almost 50 percent of the global market share between them by 2015. Smartphones differ from basic phones in that they have a more advanced computing capability and connectivity. This allows users to check emails, make bank transfers, and surf the internet almost instantaneously. The importance of these features can be seen in the fact that a projected 70 percent of people in Australia will use the internet on their phone in 2017, an increase from 67 percent in 2015. Release date unavailable; date given is the date of data access. *three months ending Dec 2018.